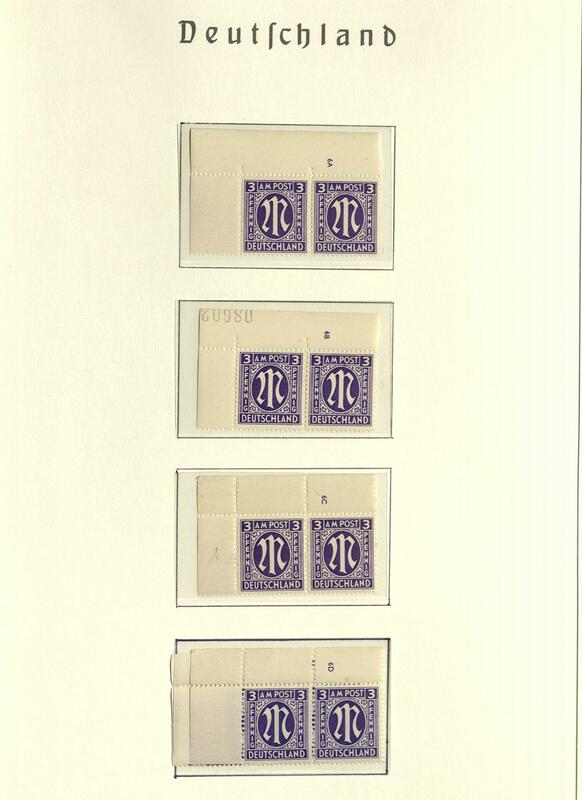 17 /⊙/ American/British Zone / buildings - interesting and extensive special collection the buildings stamps on stock cards in two boxes accommodated. Many sought specialties, various perforations, high values, upper margins, plate numbers and so on. A magnificent object! 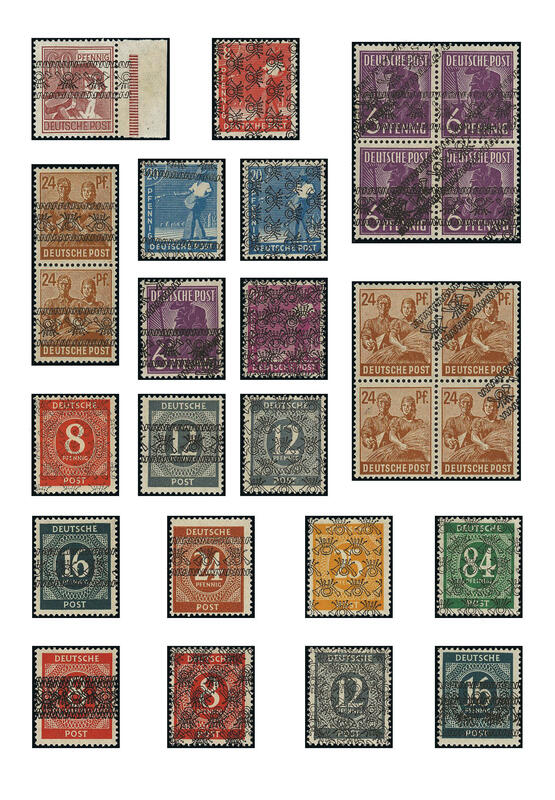 68 American/British Zone - fantastic mint never hinged collection blocks of four, except for first issue of stamps for Germany after WW II. In the number of a major listing complete. Also the worker issue including the light 60 Pfg. 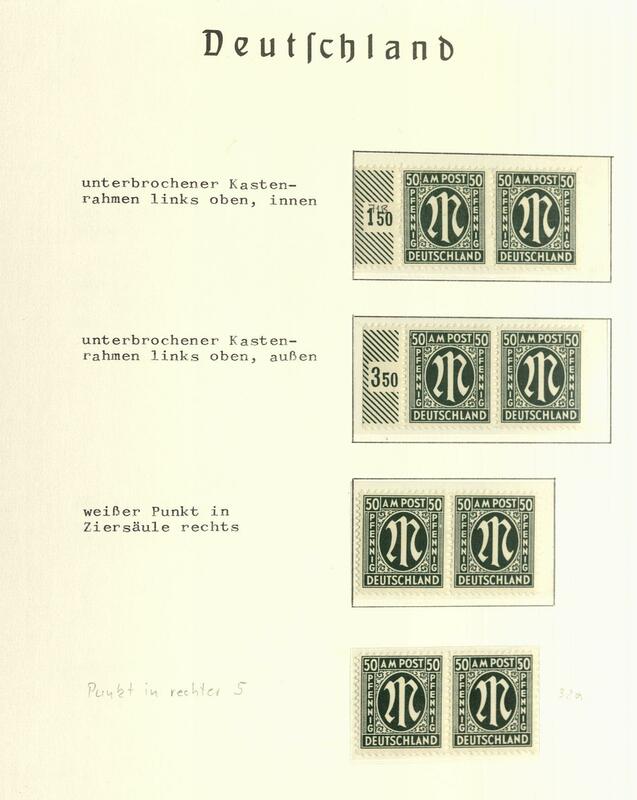 Overprint, 2 Pfg. 5 DM buildings wide perforated, 2 Pfg. 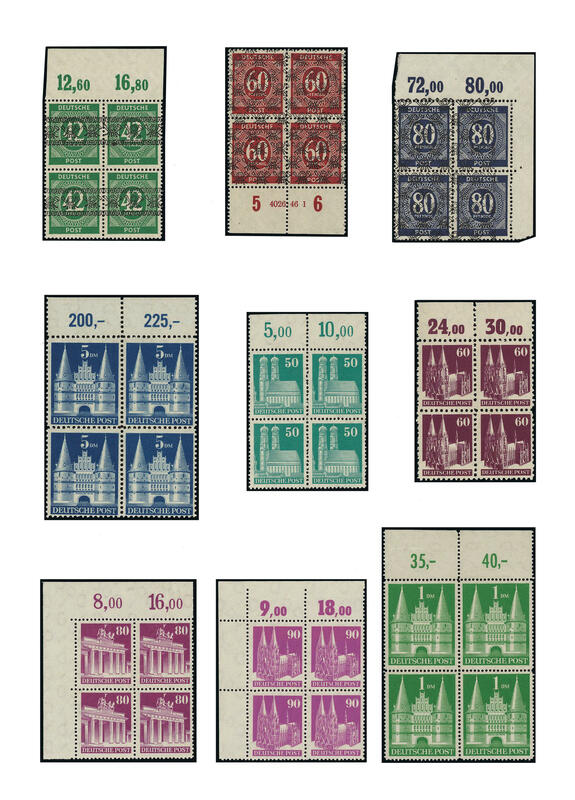 1 DM buildings close perforated, special- and commemorative sets, as well also the export fair souvenir sheet four times. 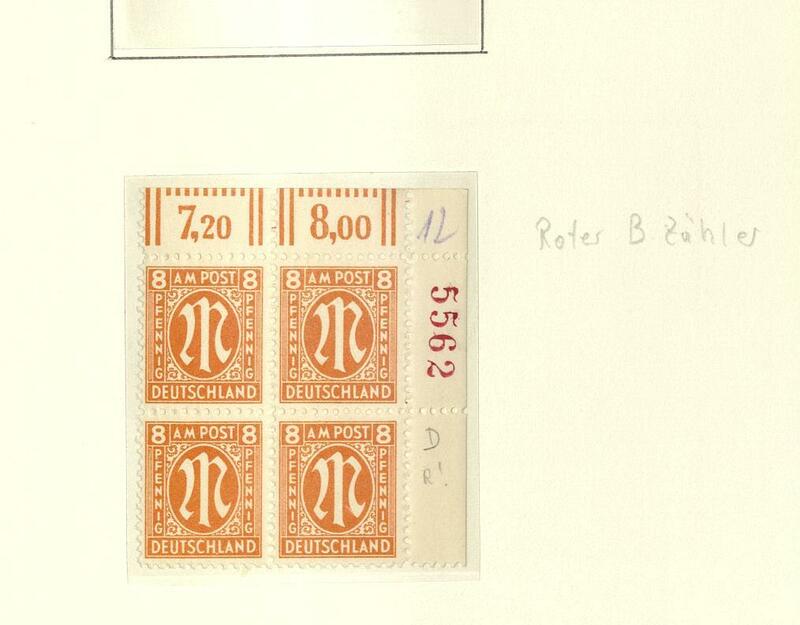 Also numerous upper margins and corners of the sheet are available. 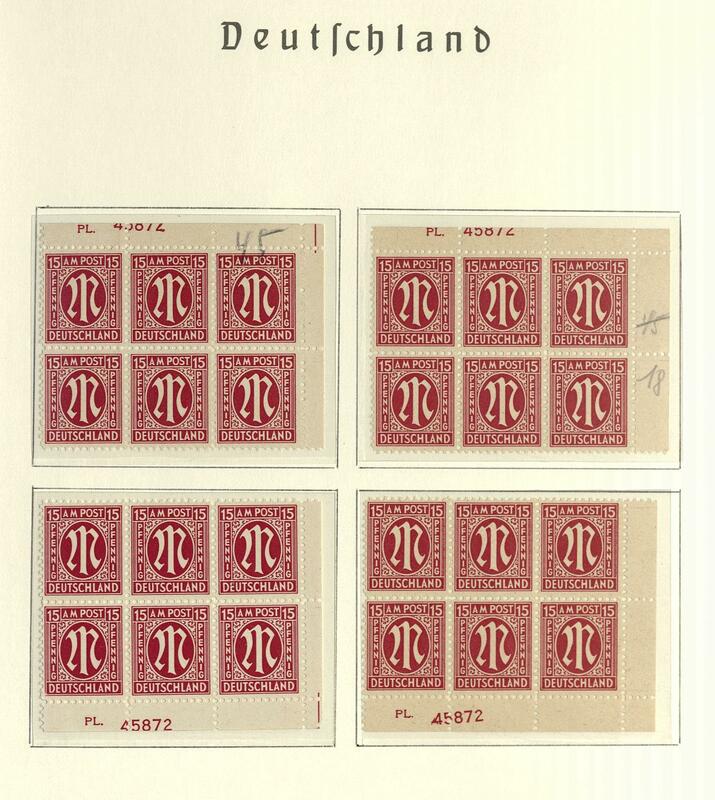 As quite sensational is the complete block of four set of all 52 values ribbon and net overprints to name, mainly from upper margin respectively corner margin with plates and rotary printings, all with photo certificates Hans-Dieter Schlegel BPP. A fantastic object, like it in this unity pretty much never to be on offer can! 87 /⊙/ American/British Zone - extensive inventory in a large stockbook in stock created with lots of material. 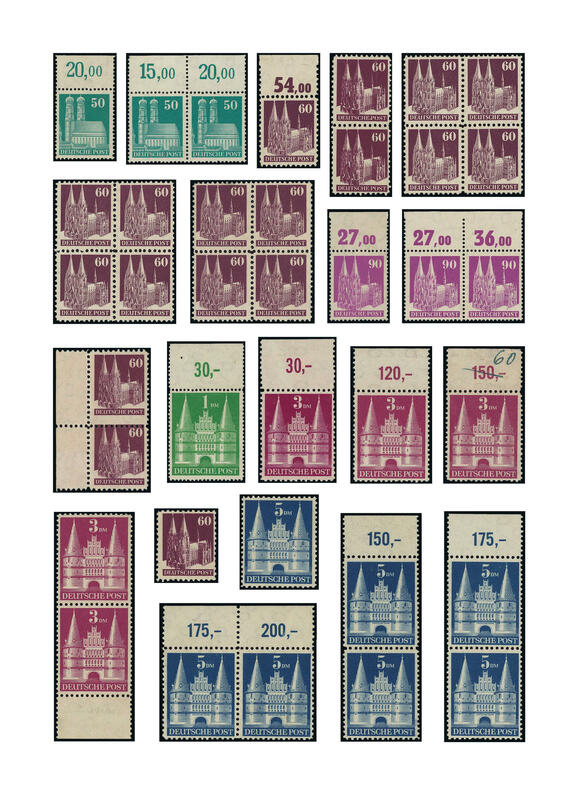 With also numerous ribbon and net overprints, an extensive part buildings, as well numerous special- and commemorative sets, as well also export fair souvenir sheet seven times used and so on. Enormous catalog value! 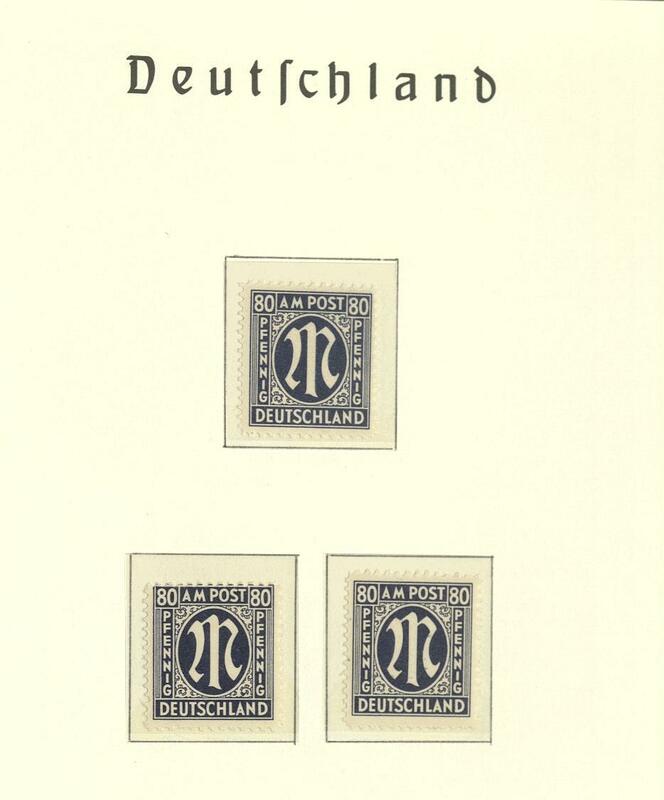 100 American/British Zone / first issue of stamps for Germany after WW II. 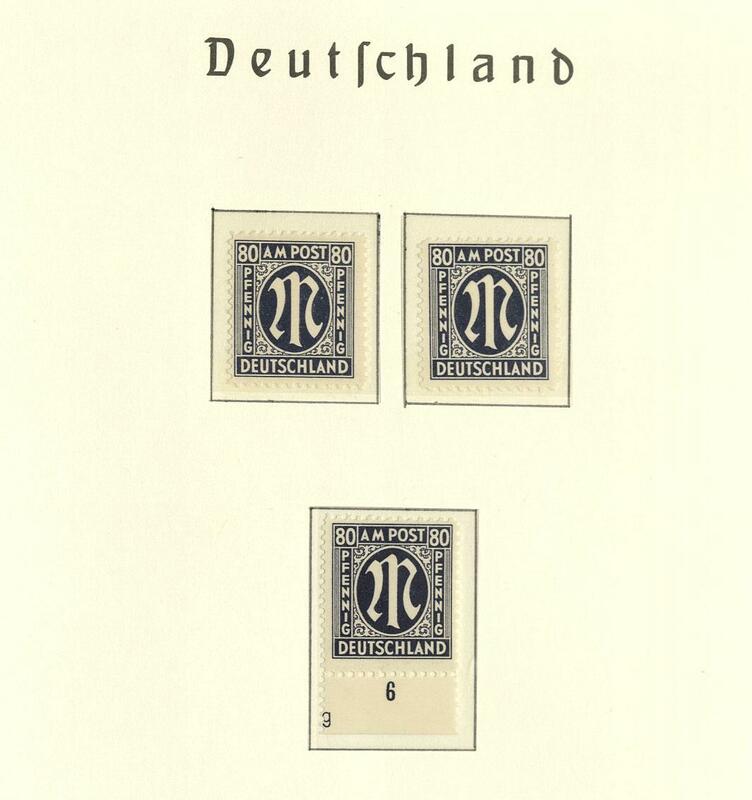 - very nice and extensive mint never hinged special collection of the issue first issue of stamps for Germany after WW II. With all three different print and all denomination value in two thick Lighthouse-albums clean made up partly with inscription. 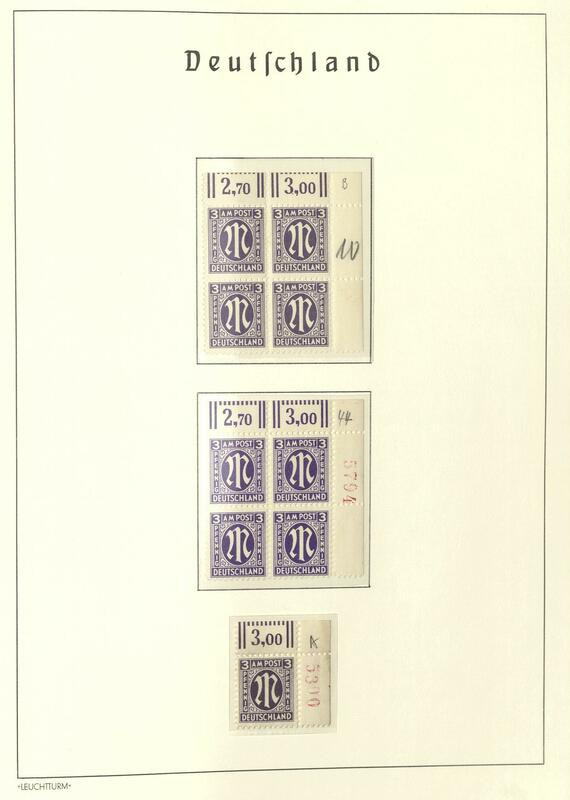 As well enormously many sought specialties including margin copies and corners of the sheet, blocks of four, pairs, one abundance different plate flaw, a number of sheet numbers, plate numbers, perforation variants and so on. 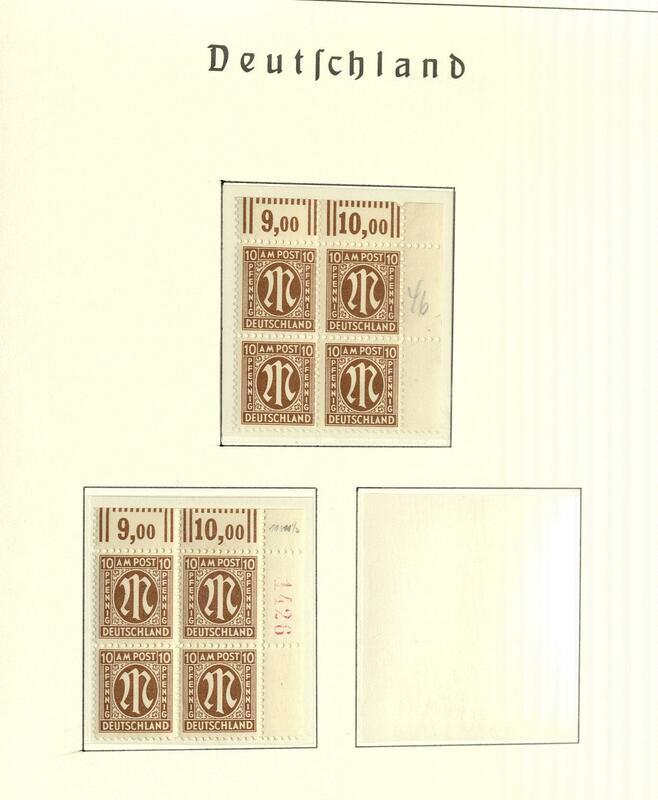 A magnificent object this attractive issue, in this richness and variety at rare intervals offered! 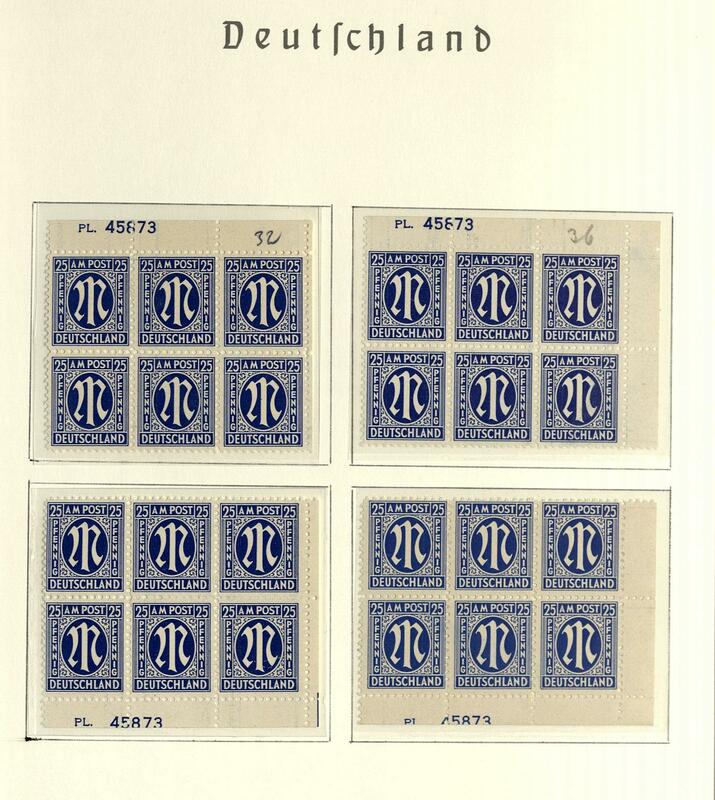 103 American/British Zone - nice mint never hinged special collection the ribbon and net overprints on lighthouse pages accommodated with numerous sought-after and rarely issues, the better values nearly all expertized Schlegel BPP. 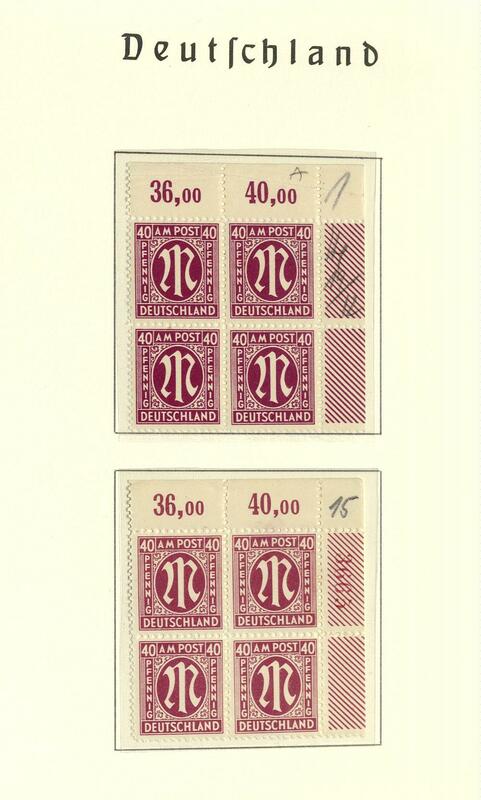 With also ribbon and net overprints on worker complete including the light 60 Pfg. 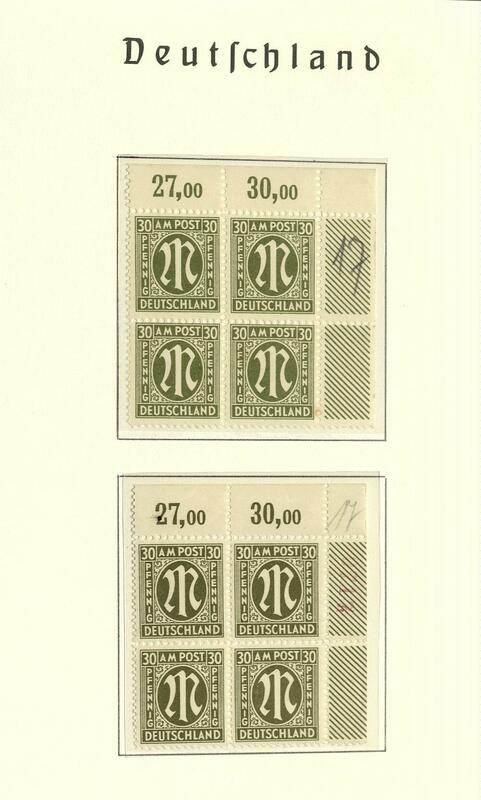 Overprint expertized Schlegel BPP, varieties like 6 Pfg. 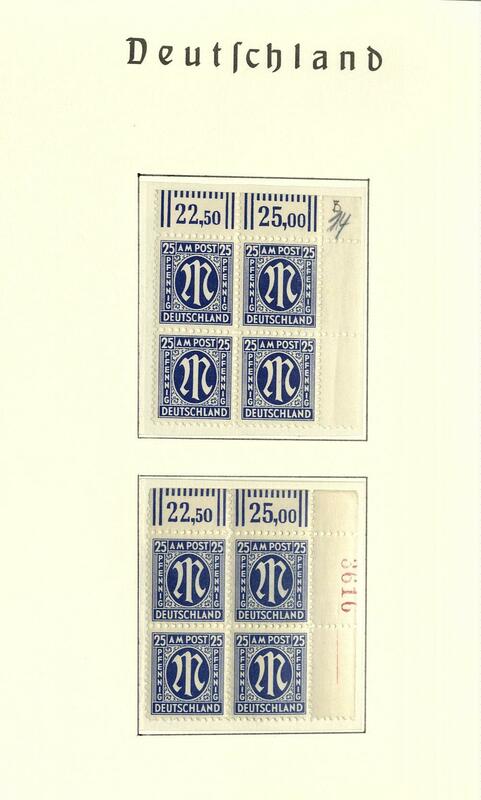 Block of four with double overprint, of it one diagonal block of four expertized Schlegel BPP (Michel 720,- €), 24 Pfg. 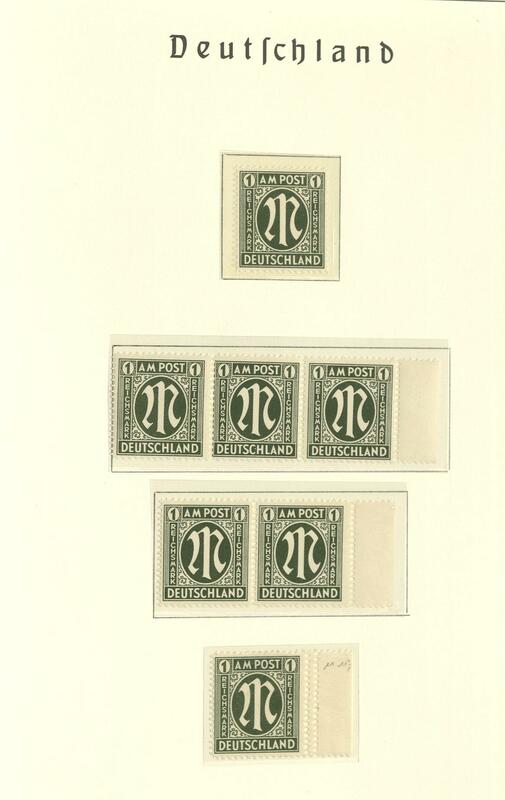 Block of four with diagonal overprint, as well a value without overprint expertized Schlegel BPP (Michel 360,- €), 8 Pfg. And 20 Pfg. 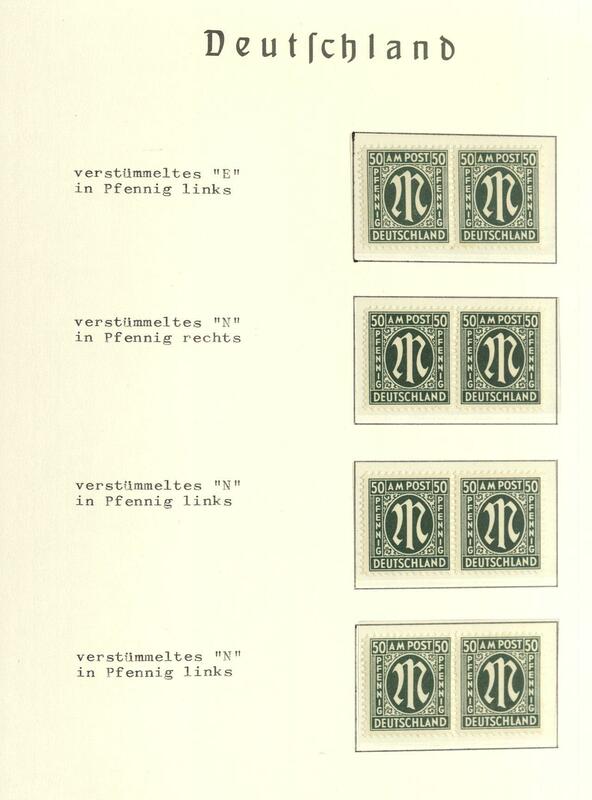 With vertical net pattern overprint expertized Schlegel BPP (Michel 160,- €), four vertical pairs with overprints type I, of it always an overprint inverted mostly expertized Schlegel BPP (Michel 340,- €), a strong part numeral imprints, as well 2-84 Pfg. 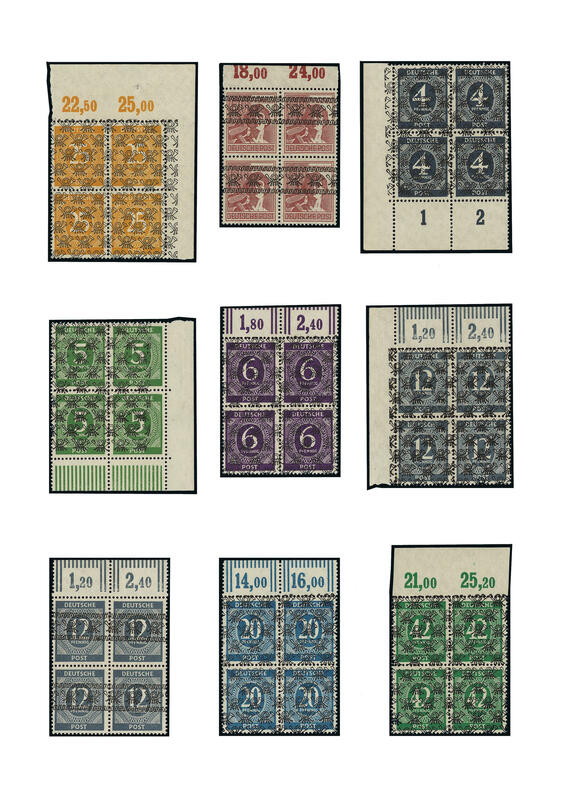 With inverted overprint expertized Schlegel BPP (Michel 900,- €), 12 values numerals with inverted net pattern overprint including the good 12 Pfg. 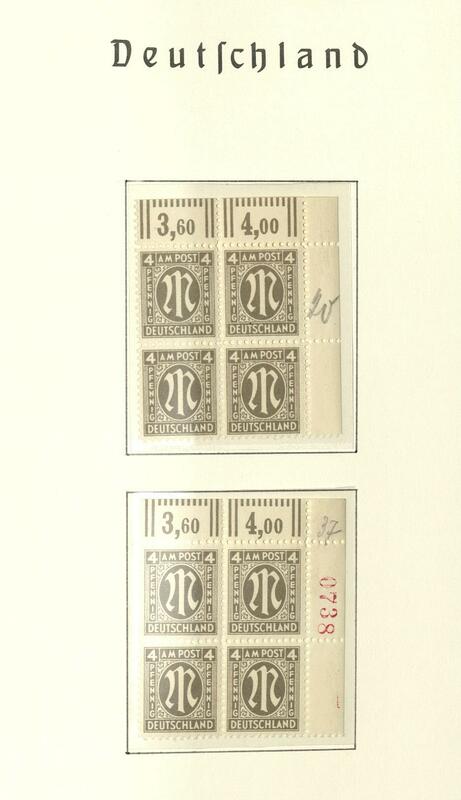 Grey expertized Schlegel BPP (Michel 1180,- €), 2-84 Pfg. 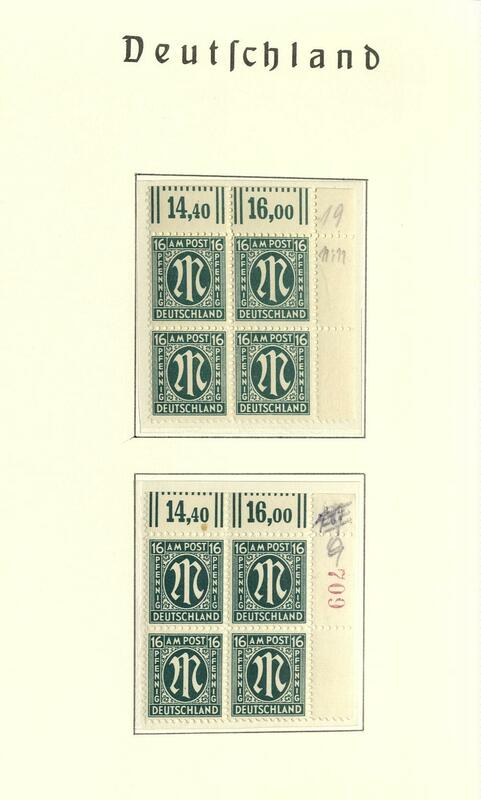 Numeral with 15 different values, in each case with double overprint expertized Schlegel BPP (Michel 800,- €), all 17 numeral values with double net pattern overprint expertized Schlegel BPP (Michel 1600,- €), 10 Pfg. 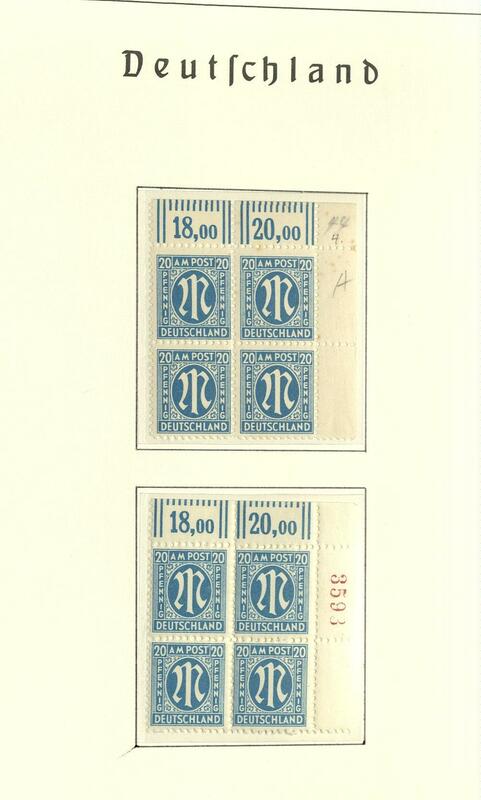 With double overprint, of it one inverted expertized Schlegel BPP (Michel 150,- €), the not issued 1-80 Pfg. 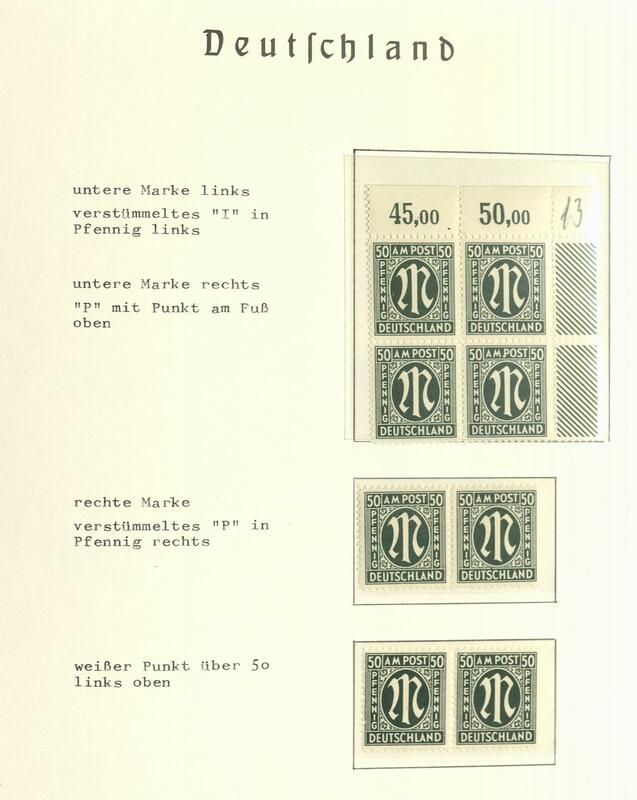 Complete with inverted overprint expertized Schlegel BPP (Michel 1000,- €), seven various not issued values with inverted net pattern overprint including the good 42 Pfg. 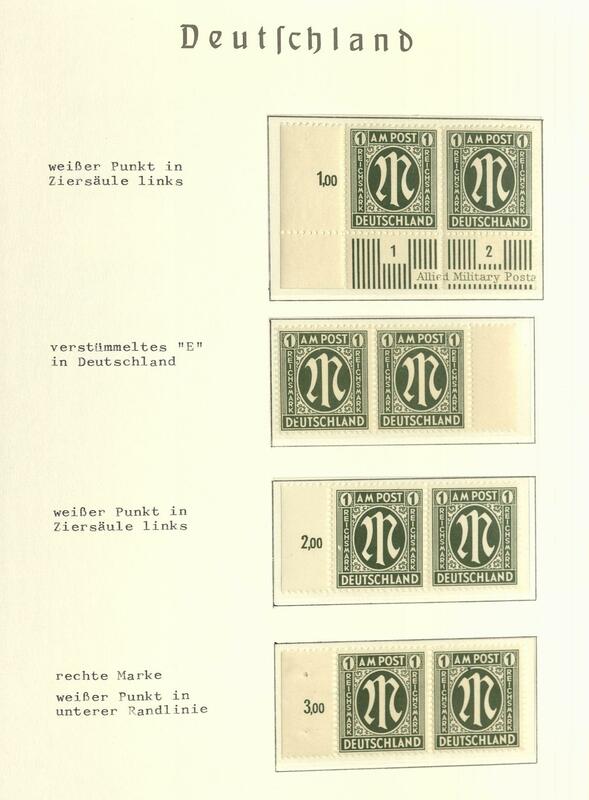 Expertized Schlegel BPP (Michel 1660,- €), all nine not issued values with double overprint expertized Schlegel BPP (Michel 1100,- €), as well 20, 42 and 60 Pfg. 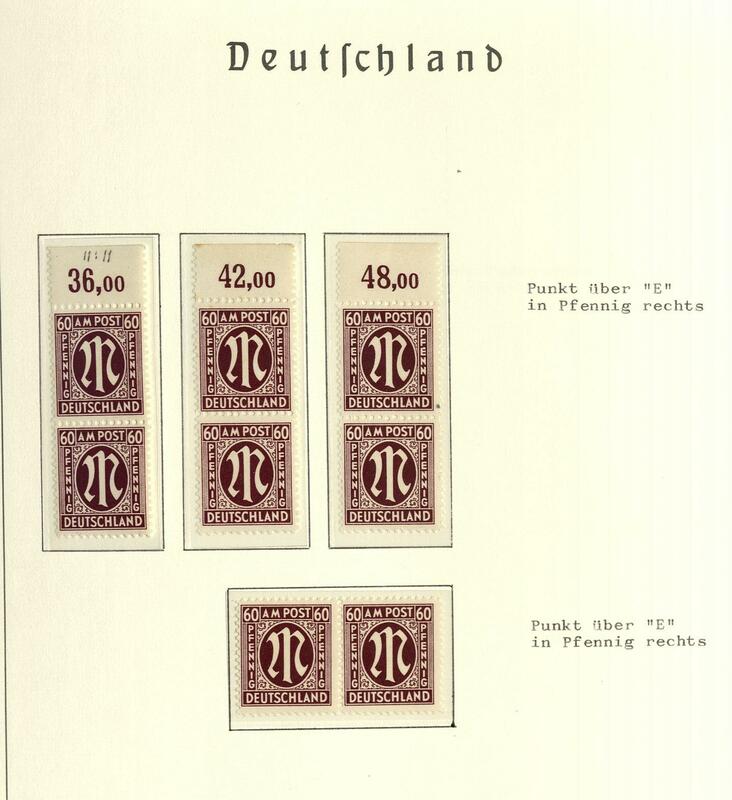 With double net pattern overprint expertized Schlegel BPP (Michel 1200,- €), as well also upper margins with plates and rotary printings and so on. A very nice object, which with a high capital expenditure formed was, whereby many as single lots on auctions one acquired! 104 American/British Zone / buildings - very nice and mint never hinged special collection the buildings issue on lighthouse pages accommodated with sought-after issues, thereby also nice part corners of the sheet and upper margins, various perforations and watermark, plates and cylinder printings, 60 Pfg. Wide perforated from the left upper corner 2 time with different types, a good part unperforated values with useful issues, double impression, 60 Pfg. 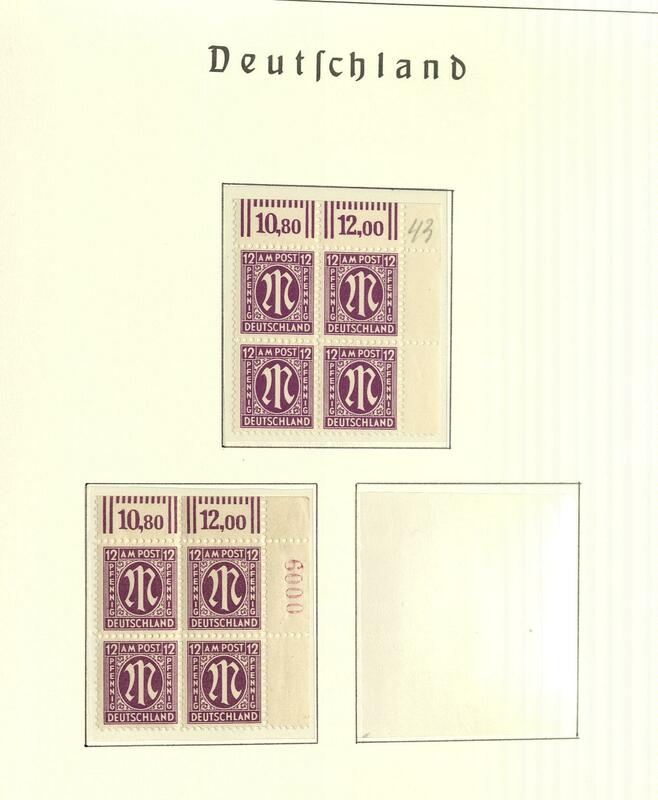 Wide perforated in the horizontal strip of four vertical unperforated mint never hinged, strength perforation varieties, 60 Pfg. Unperforated in the horizontal gutter pair, as well a good part Mark values, as well short and high stair, as well various perforations and so on. A very nice object! 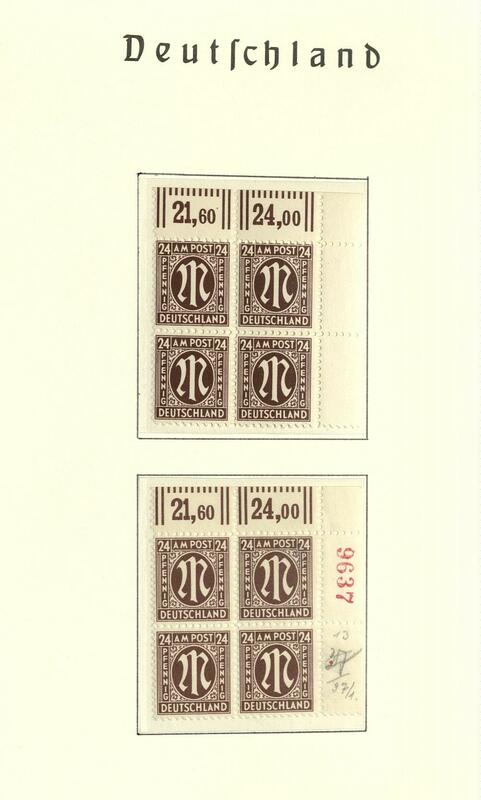 218 ✉ American/British Zone / first issue of stamps for Germany after WW II. 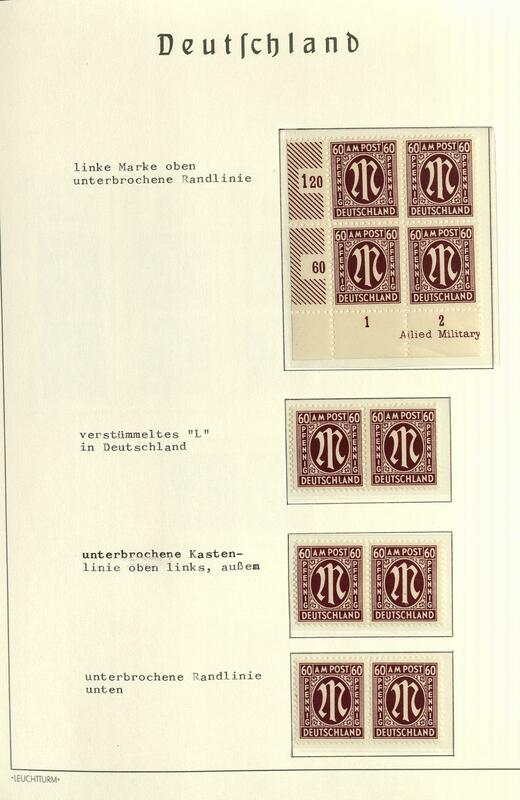 - interesting inventory from covers and cards of the issue first issue of stamps for Germany after WW II. Packed in a carton, with also much legitimate postage, various postage steps, single- and multiple franking, mixed prints and so on. Treasure trove for specialists! 219 ✉ American/British Zone - extensive inventory from covers and cards packed in a carton. 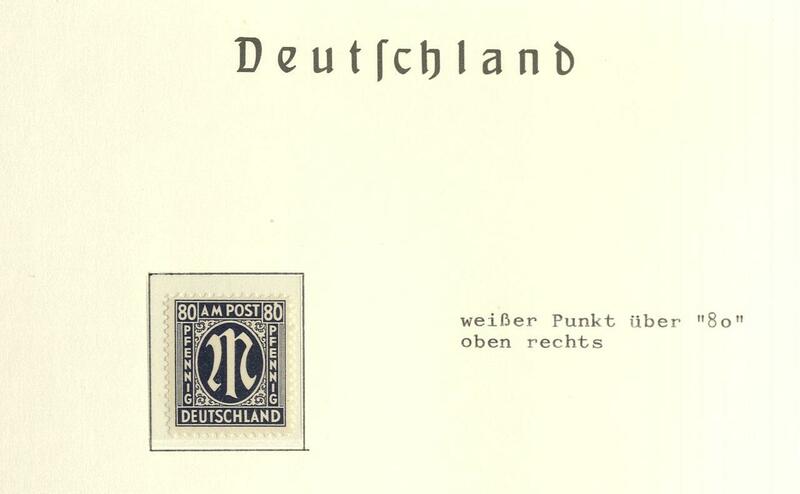 Thereby many interesting documents, an extensive part legitimate postage, various postage steps and use form, registered, interesting mixed frankings American/British Zone / allied occupation, ribbon and net overprints, buildings and so on. Treasure trove! 393 /⊙ American/British Zone - nice and extensive lot the ribbon and net overprints on worker and numerals in the stockbook, with also many special feature as for instance also numerous upper margins, corners of the sheet, color shades and so on. A nice inventory for specialists! 517 /⊙/ American/British Zone / buildings - extensive lot the buildings issue from 2 Pfg. - 5,- DM en masse stockbook accommodated and chronologically sorted with lots of material. 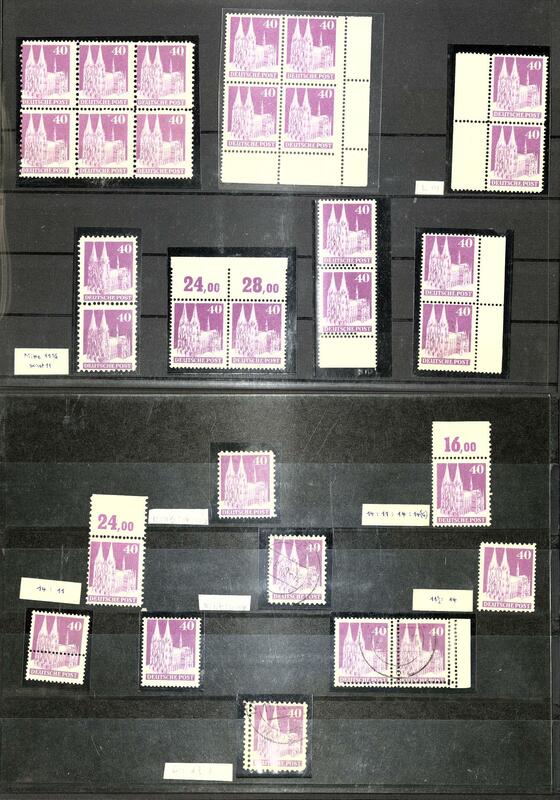 As well a great many mint never hinged / unused issues, upper margins, various perforations, better values and so on. Very high catalog value! 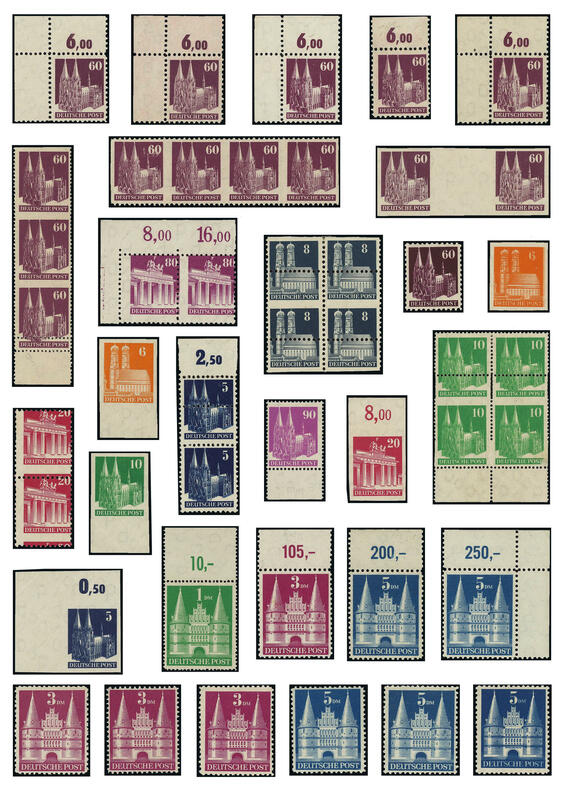 672 x American/British Zone - extensive inventory packed in a carton, with also a great many ribbon and net overprints, often multiple, in bags and on stock cards and so on, as well also export fair souvenir sheet and so on. 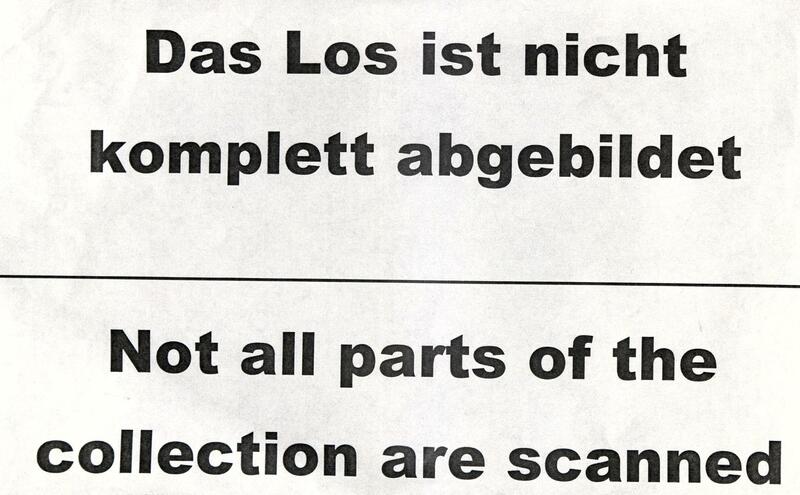 Not be searched to colours. Treasure trove! 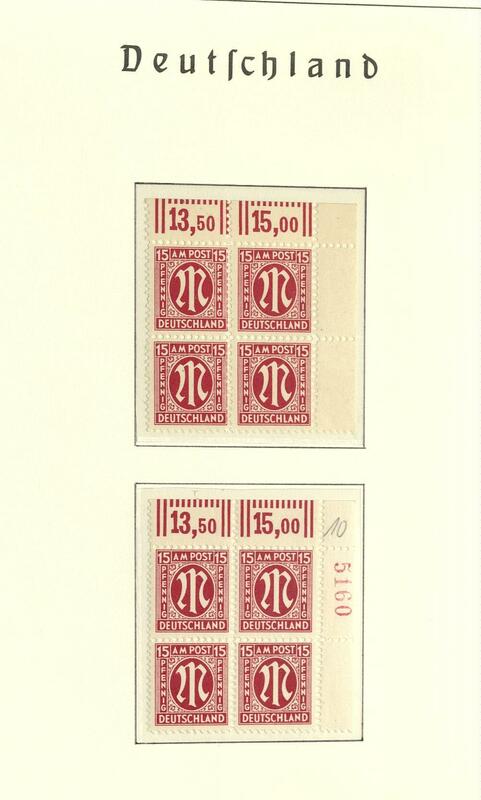 841 / American/British Zone / first issue of stamps for Germany after WW II. 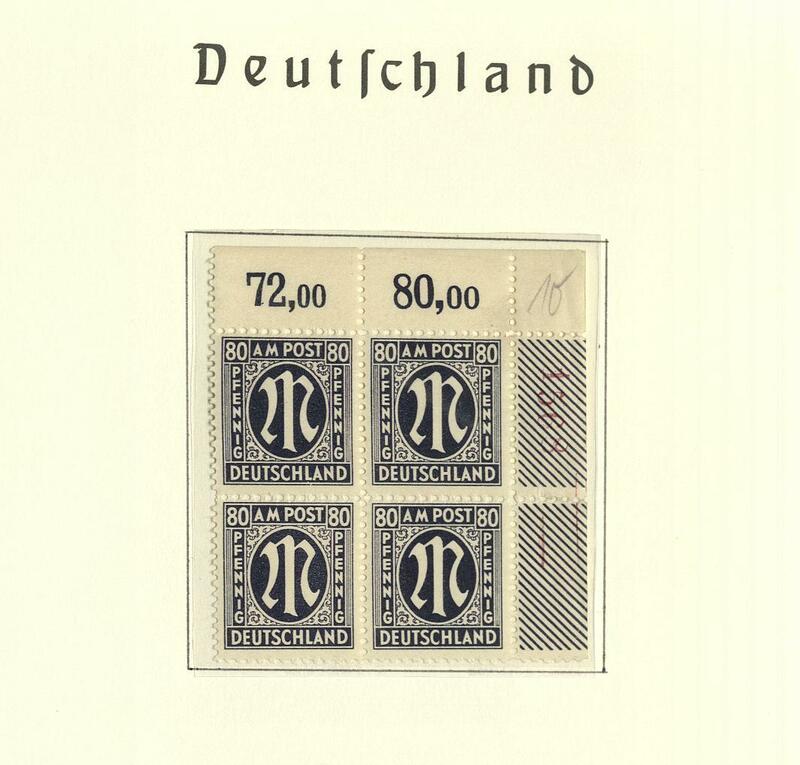 - extensive inventory of the issue first issue of stamps for Germany after WW II. In two sheet folder accommodated with sheet and parts of sheets, all mainly mint never hinged as well approximate 80 complete sheet. Unchecked for plate errors and so on. Treasure trove for specialists! 865 /⊙/ American/British Zone / buildings - interesting and extensive inventory in four stock books, two ring binder and two sheet folder accommodated with a lot of material. 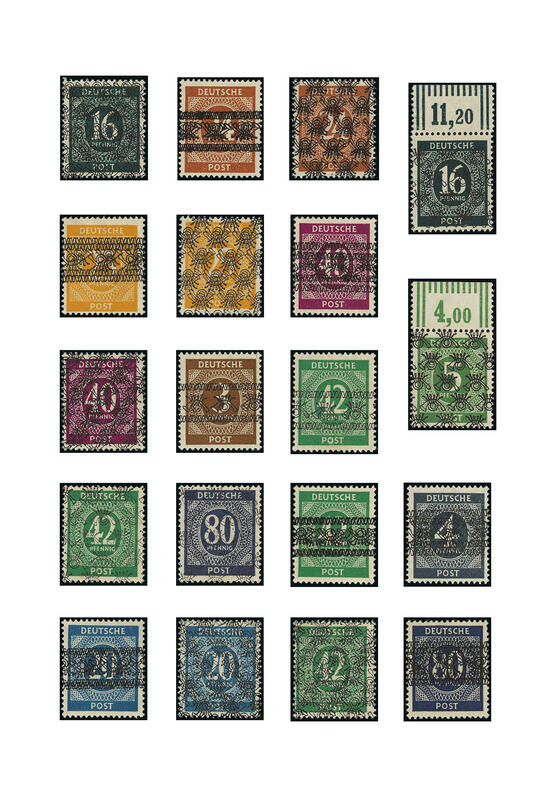 As well platings, mint never hinged sheet and parts of sheets different denomination value including 100 copies the 25 Pfg. 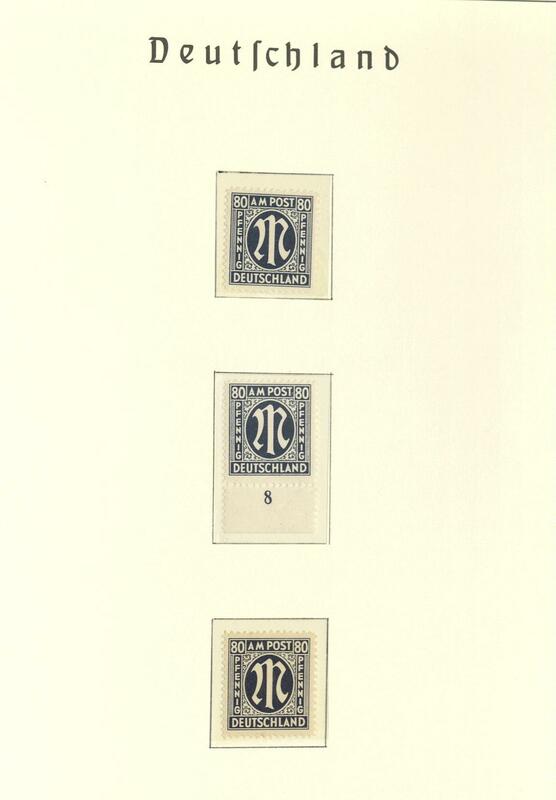 Close perforated including the plate number, as well much used material different denomination value. Also an extensive special collection the 60 Pfg. Buildings is included and with inscription mounted. A very interesting and versatile object for specialists! 869 /⊙/ /✉ American/British Zone / overprint items - rich collection ribbon and net overprints on worker and numerals with lots of material in the safe ring binder formed. As well colours and color shades, with ribbon and net pattern overprint, better values, partly expertized Schlegel BPP, covers, plates and cylinder printings and so on. An extensive object, favorable valued! 936 American/British Zone - extensive special collection plate flaw the at the Postal service edition in six albums, all to study group special catalogue identified with detailed description / illustrations. The collection includes over 1200 various plate flaw. All in the Spezialversand with high acquisition price delivered. 1059 American/British Zone - clean mint never hinged collection on Borek hingeless preprinted pages with useful issues. 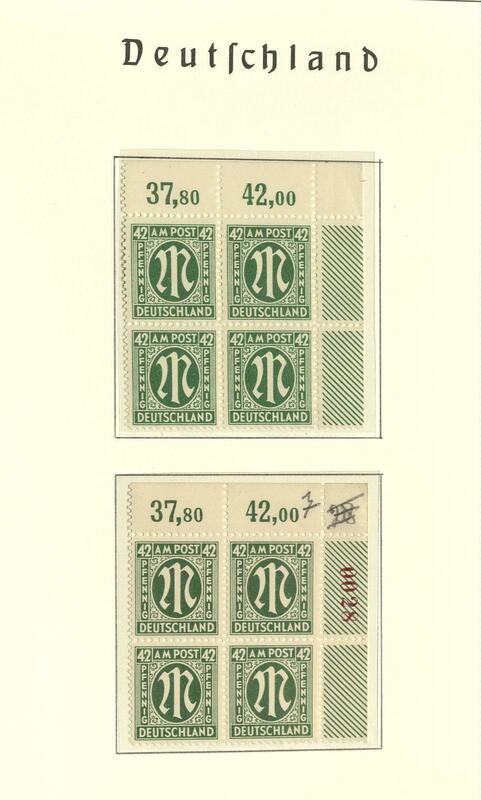 With also first issue of stamps for Germany after WW II., various ribbon and net overprints on worker, 2 Pfg. 5 DM buildings wide perforated, the complete set buildings close perforated, special- and commemorative sets and export fair souvenir sheet. Besides allied occupation complete including help for the aged souvenir sheet pair. Favorable! 1218 ⊙ American/British Zone - extensive used collection ribbon and net overprints on Schaubek pages, specialized formed. Also the lightly 60 Pfg. 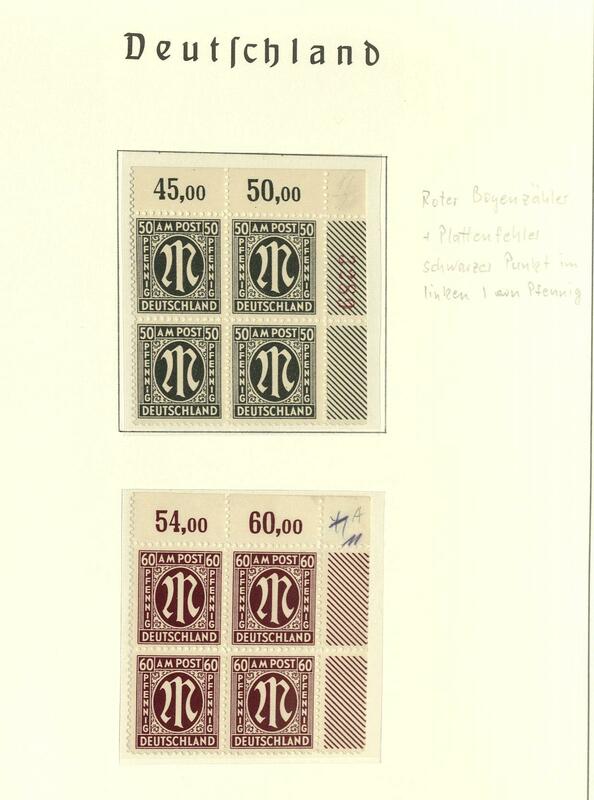 Worker with overprint, as well numerous color shades and so on. Interesting object! 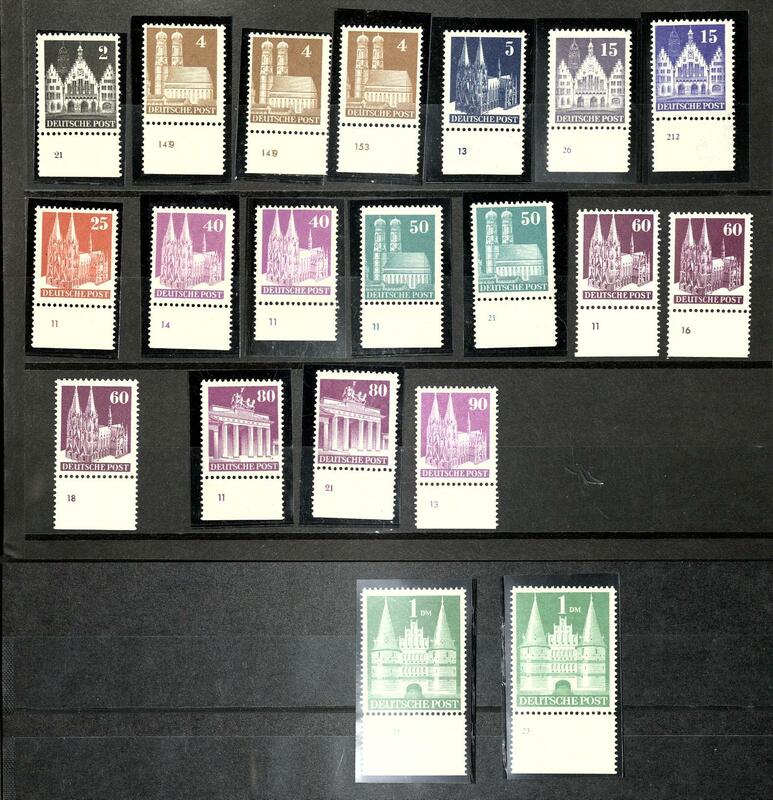 1219 ⊙ American/British Zone - nice used collection the special- and commemorative issues with complete sets, as well also color shades, export fair souvenir sheet and so on. Favorable!